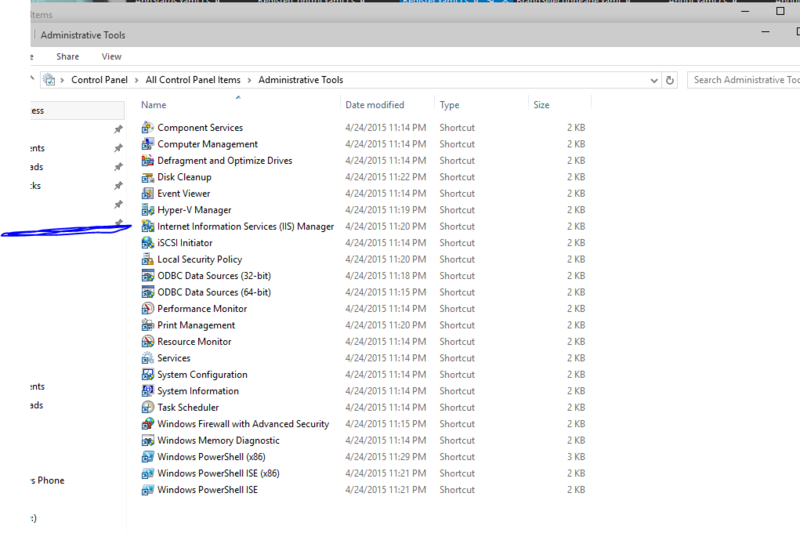 How do you open IIS (Internet Information Services) Manager using Windows 10? 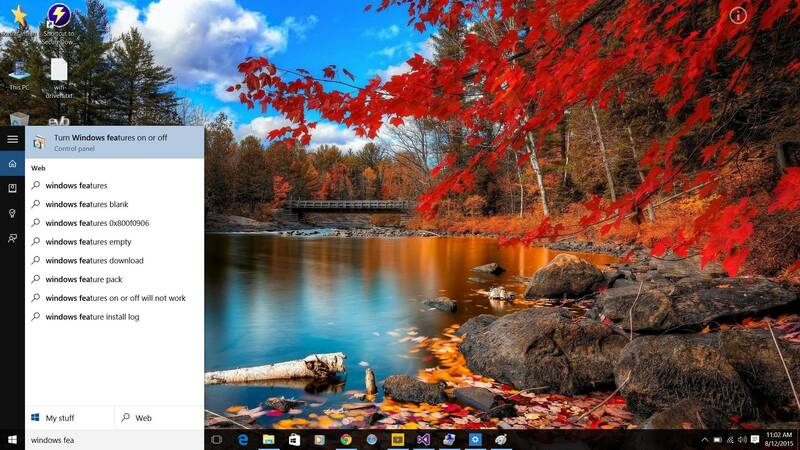 I have installed the developer preview of Windows 10 and cant seem to find IIS Manager? It is not in Control Panel > Administrative Tools. When I browse to the folder C:\Windows\System32\inetsrv it is empty. I did a full search of my hard drive to find inetmgr.exe and found three copys and none of them would open, when I tried to open them it says "This App cannot Run on your PC" To find a version of the App that works contact the publisher. I know IIS works because I have ran local ASP.net apps through VisualStudio but I cant seem to find a way to launch IIS Manager to do some configurations for a site. Thanks to @SLaks comment above I was able to turn on IIS and bring the manager back. Press the Windows Key and type Windows Features, select the first entry Turn Windows Features On or Off. Make sure the box next to IIS is checked. If it is not checked, check it. This might take a few minutes, but this will install everything you need to use IIS. Actually you must make sure that the IIS Management Console feature is explicitly checked. On my win 10 pro I had to do it manually, checking the root only was not enough! Choose "Turn Windows Features On/Off"
@user1664035 & @Attila Mika's suggestion worked. You have to navigate to Control Panel -> Programs And Features -> Turn Windows Features On or Off. And refer to the screenshot. You should check IIS Management console. Credit and thanks to Mikhail's comment above. Make sure the box next to IIS is checked. You good to go. MattyMerrix elaborated very well, I want to add that if you can see "ask me anything" box i.e. Cortana "the intelligent software" at the taskbar then there is no need to press the windows key. Launch Windows Features On/Off and select your IIS options for installation. 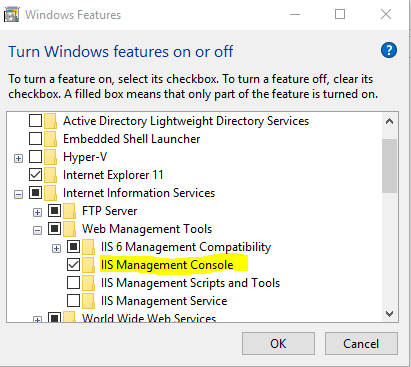 For custom site configuration, ensure IIS Management Console is marked for installation under Web Management Tools. Not the answer you're looking for? Browse other questions tagged windows iis windows-10 or ask your own question. How to quickly host a .aspx file locally? 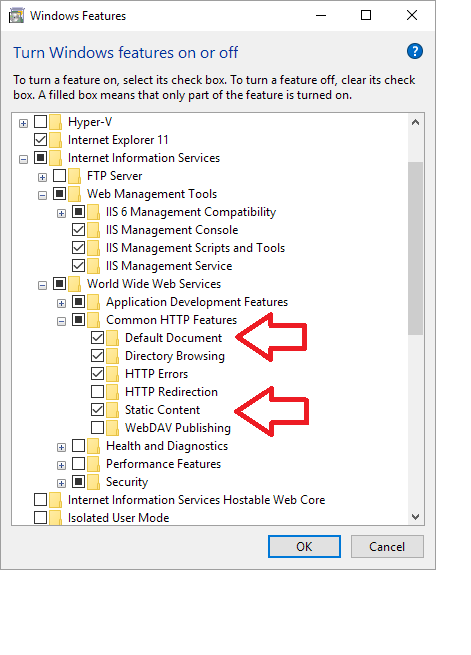 How are Applications Removed from the IIS Application Pool?